After 10 years of the 4-H History Team existence, and six years of counting website visitors, your 4-H History website has received over 400,000 visits worldwide. Thanks for your support. As patriotism swept the country, 4-H members joined the war effort enthusiastically. With slogans like “Back up the Cannon with the Canner,” the government promoted conservation and food preservation. Ninety years ago this month the first 4-H Members pitched their tents on the Washington Mall to learn, share and make their presence known in the Nation’s Capital. Delegates and chaperones meet National 4-H Staff as they arrive at one of the early National camps in Washington DC. Lazarus Lynch, a multimedia personality and chef beat out 15 other celebrity chefs to win a substantial financial gift for 4-H. The TV cooking show “Chopped” sponsored the competition. Google his name! 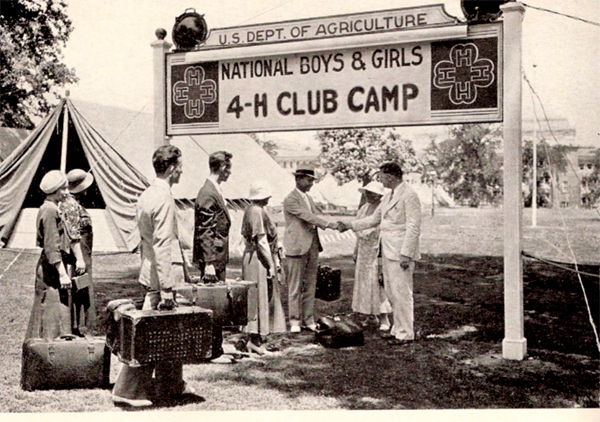 In a 1929 radio broadcast during National 4-H Camp on the DC Mall, Mrs. Hoover asked 4-H clubs to “be of service to their communities.” Continuing her interest in gender equality, Mrs. Hoover stressed that boys had an equal responsibility in homemaking. You are the most important resource in preserving 4-H History and we rely on your kind assistance to help accomplish our goals. This time, we’re looking for a copy of the 1953 national 4-H poster; the original was painted by W. C. Griffith who painted 18 4-H posters and 16 national 4-H calendars.